Oxford University students cover Shakira’s Hips Don’t Lie and Waka Waka! A group of Oxford University students have just pulled out the best cover video we have seen in a long, long time! Singing group Out Of The Blue are raising money for charity with their own version of Shakira’s hit Hips Don’t Lie – and a bit of her 2010 World Cup song Waka Waka (This Time for Africa) too! The 15 smartly-dressed students from Oxford can be seen dancing around the university grounds, singing the tune ‘a capella’, which is where you sing without music and make the sounds of the instruments with your voice! They hope to raise lots of money for Helen & Douglas House, a children’s hospice in Oxford that helps care for children and young adults with life-limiting conditions. Shakira herself seems pretty impressed! 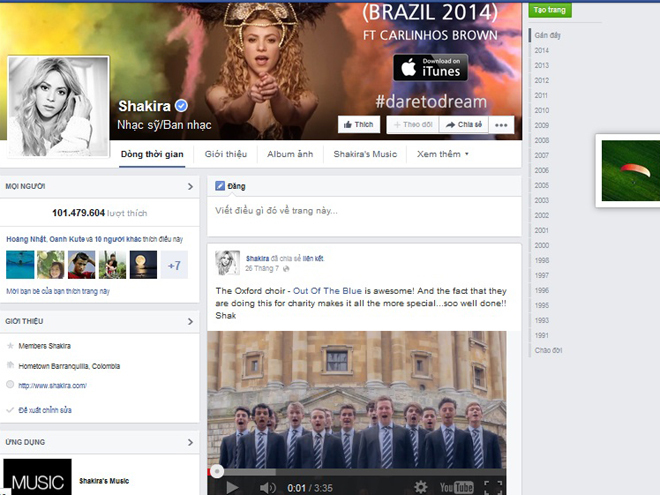 She shared the video on her Facebook page to her 101 million fans! You choose how much you pay, so you can give as much or as little as you’re able to afford! It’s all for charity but you still need to make sure you ask your parent/guardian’s permission first!